Although it has its weaknesses, the Sony Xperia Z3 Tablet Compact is a fabulous piece of hardware. The battery life is incredible, the display is super-bright and performance is excellent. Couple these attributes with a slim, lightweight, water-resistant chassis and you have a high-calibre compact tablet – one that holds an edge over all its rivals. The Xperia Z3 Tablet Compact is a refined, powerful Android tablet that exudes the premium feel Sony hangs its hat on. But pricing the tablet at full-sized iPad Air 2 levels seems misguided, especially as demand for premium Android tablets continues to decline. Those still in the market for a high-end Android tablet should turn their attention towards the Editors' Choice-winning Galaxy Tab S 8.4, which has the best display of any tablet, and a lower price tag than the Z3 Tablet Compact. The Sony Xperia Z3 Tablet Compact is an excellent Android tablet, but is likely priced $80 to $100 too high for mass consumer sales. The audio and video experience is excellent, it was a joy to carry such a light tablet, and it has just about everything one could want in a tablet. It’s still a good tablet though; still plenty powerful enough, still has a great display, carries oodles of connectivity options, has decent battery life and packs a versatile, agile operating system with Google’s Android. Plus it can take a dunk in the bath and it’s insanely thin and portable – I can’t emphasise this last point enough for people who have always wanted a tablet that can go wherever they go and which weighs next to nothing: this is most assuredly it. Sony's Xperia Z3 Tablet Compact is a lovely piece of hardware. It's light on flair, has a borderline-terrible camera, mediocre stereo speakers and a slightly tired Android build. On the flipside, though, it has a fantastic display (even if it is only a 1080p panel), outstanding performance and long battery life. Maybe I'm just boring, but the facet I like most is how thin and light the tablet is. The Xperia Z3 Tablet Compact isn’t as powerful as the Nexus 9 and has a smaller, lower resolution screen, so it’s game over, right? Not even close. The Compact is a lot lighter and smaller, has a storage expansion slot, is water- and dust-proof and thanks to having a slightly smaller screen has near enough the same pixels-per-inch matrix density. It's great to see Sony finally make a smaller tablet and the Xperia Z3 Tablet Compact is super svelte and is waterproof to boot. Hardware is decent but not mind-blowing and while rivals like the Galaxy Tab S offer a bit more gadgetry, Sony offers killer features for audiophiles and gamers. The Sony Xperia Z3 Tablet Compact is easily one of the slickest Android tablets we've seen to date with brilliant performance that makes short work of anything you throw at it, a slim, waterproof design and a camera that's not too terrible, but it's fairly expensive too, with prices starting at £299 for the Wi-Fi only model. The iPad mini 2 starts at £239, giving you a bit more value for your money compared to Sony's offering, but if you're really after an Android tablet and you've also got a PS4, the Z3 Tablet Compact is a good bet if you can afford it. There are unique strengths of Xperia Z3 Tablet Compact, such as its PS4 Remote Play feature, but the competition is fierce. From the iPad's premium build and superb apps, to Samsung's excellent high-resolution display, or the Nexus 9's 64-bit Tegra power and pure Android Lollipop offering, the Sony finds itself struggling to make as strong a case. It's great to see Sony finally make a smaller tablet and the 8in form factor is proving to be increasingly popular. The Xperia Z3 Tablet Compact is super thin and light and is waterproof to boot. Hardware is decent but not mind-blowing and while rivals like the Galaxy Tab S offer a bit more gadgetry, Sony offers High-Res audio and a killer feature for gamers in the form of PS4 Remote Play. It's a great effort from Sony if you're looking for a high-end 8in tablet. There's no denying that the Xperia X3 Tablet Compact is one of the most attractive Android tablets available right now, and the fact that it combines aesthetic charm with some powerful internal tech and an excellent screen doesn't hurt, either. The ability to stream PS4 games to the tablet's screen is another big selling point, although you shouldn't expect the exact same experience that you get on your television. If you're dead-set on a high-end compact Android tablet, the choice comes down to this or the Samsung Galaxy Tab S 8.4. The Galaxy Tab S 8.4 has a superior, higher-resolution screen, but can't match the Sony tablet's build quality, 3D performance or battery life. We think the Samsung's amazing screen makes it just pip the Z3 Tablet Compact overall, but Sony's tablet is a better bet to use on the move. 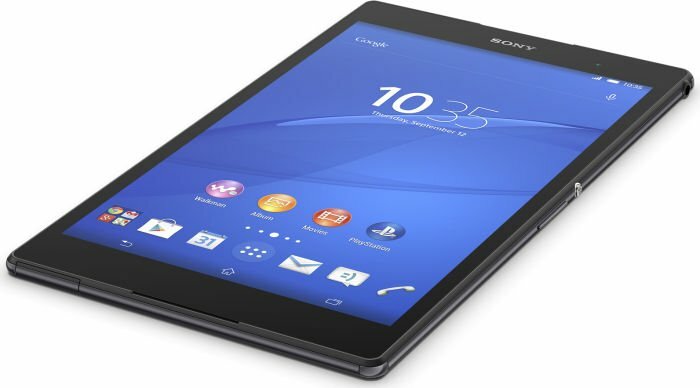 Starting at £329, the Sony Xperia Z3 Tablet Compact is a serious iPad MIni rival. The sharp screen and slim and light design make it a great device for taking on your travels and enjoying movies, apps and games, while the rugged, water resistant build keeps it safe from harm. Battery life isn't quite as good as the iPad Mini's, but it'll see you through the day. Without a doubt, Sony has put a lot of engineering effort in its latest slate and the results are visible. To sum things up, we get an extremely compact, light, and water-proof tablet that has an outstanding battery life and most of the bells and whistles you'd expect from a tablet as per late 2014's standards. If we disregard the color inaccuracy of the display, this 8-inch champ could very well be one of the best slates you can throw your money at now. However, we can't simply omit the fact that Sony has once again spread itself thin and failed to deliver in this pretty fundamental aspect. Convincing people they need an Android tablet - let alone a premium one - is no easy task. But the Z3 Tablet Compact is a lovely thing. It's a slim, light and reliable couch or commute companion. The screen looks brilliant despite being "only" Full HD. The waterproofing may sway people away from choosing an iPad Mini. Phones and tablets are converging - phones are already in the 5.5-6 inch range and 7-8 inch tablets are more popular than their 10" siblings. There was some speculation that the 7.9" iPad mini will eclipse the 9.7" iPad Air, but with the underwhelming mini 3 launch we're not so sure anymore. The Sony Xperia Z3 Tablet Compact is a direct iPad mini competitor and Apple's neglect of the mini makes this a perfect time for Sony to strike. Considering that it is last year's product, the iPad mini with Retina Display is hanging in there. We prefer the Sony, principally because it is more powerful, thinner and lighter, has a better camera and - glory be - it's cheaper. But the iPad mini remains a stunning device, and for those that prefer Apple it won't be a let down. Overall, both the Sony Xperia Z3 Tablet Compact and Nexus 7 are brilliant smaller tablets. The Sony Xperia Z3 Tablet Compact will offer you more in the way of power, connectivity, battery and capacity, but it'll cost you £100 more, so it really comes down to your budget on this one. One thing to keep in mind, though, is that there are rumours that the Nexus 7 is going to get an update soon, so it might be worth hanging on to find out what Google has up its sleeve before you buy the current version. Our first thoughts are that the Xperia Z3 Tablet Compact is a great looking device that is super slim, easy to hold and offers some powerful specs in a easy-to-manage smaller device. It's lightweight, has a decent battery capacity and for those that want a tablet to play PS4 games on, then it looks like it will be a clear winner. If you want the most tablet hardware you can get for the least amount of cash, you may find the equation a little off in the Sony Xperia Z3 Tablet Compact. The screen resolution is lower than the top contenders, and this shows up when web browsing and in the interface. However, it's not really a concern for watching video or playing games, where the Xperia Z3 Tablet Compact excels. Positive: Very good with high sensitivity touch display; slim and light; very complete camera; precise and realistic speakers; excellent performance; pretty good battery. Positive: Lightweight; good sharpness and contrast of the display; resistance against water and dust. Positive: Dust and water resistance; good performance; good screen; streaming games PS4. Positive: Dust and water resistance; good performance; good screen. Positive: Good display; nice design; very slim and light; powerful and stylish. Positive: Slim and light; water-resistant; secure grip with the palm; good display. Negative: Mediocre camera and battery life. Not many companies have jumped into the mini tablet (8-inch) category. As for now, Samsung, with its wide range of mini tablets and Apple with its iPad mini control most of the market share in this category. 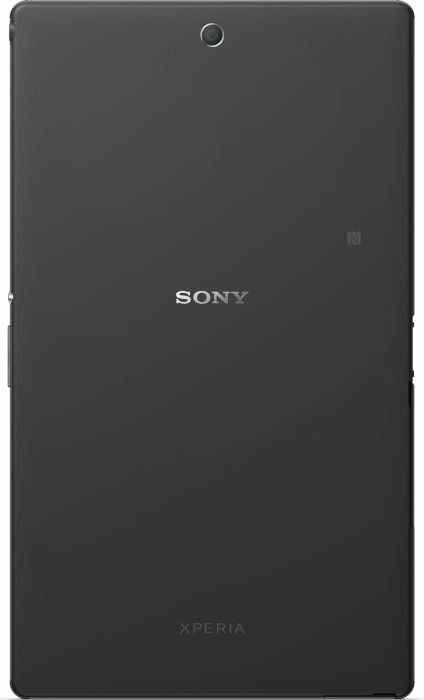 Sony has just jumped into this category as well with its latest Xperia Z3 Tablet Compact. Unlike its 10.1 sibling, the Z3 tablet compact features a slimmer body with narrower bezel. At just 6.4 mm thick and weighing just 270 g, it is slimmer than both the iPad mini and Samsung Tab S.
It also features a rubberized back and adopts the design and features of the bigger Z3 smartphone. Apart from that the Z3 tablet compact carries an IP8 rating for protection against dust and water. The tablet has adopted a 1920 x 1080p FHD 8-inch display with high brightness level and deep colors. The tablet is powered by a 2.5 GHz Qualcomm Snapdragon 801 quad-core processor with 3 GB of RAM. Certainly, this is enough to qualify as a high-end tablet and is sufficient for gaming and playing videos in FHD. There is 16 GB of built-in storage and it can be expanded by inserting a micro-SD memory card. At the back of the tablet is a 8.1 MP camera with no flash and on the front is a 2.2 MP camera. Both cameras support 1080p video recording. 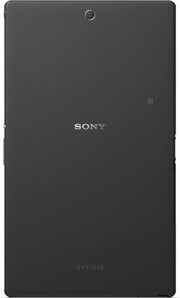 The 4500mAh battery lasts up to 13 hours of high quality video playback according to Sony. The Sony Xperia Z3 Tablet Compact comes with all the usual connectivity options, NFC, GLONASS as well as Wi-Fi and DLNA support. The tablet will run on both 2G and 3G networks, along with a 4G LTE in some countries. Being a Sony product, it certainly fits well into the whole PlayStation ecosystem and Sony entertainment system. 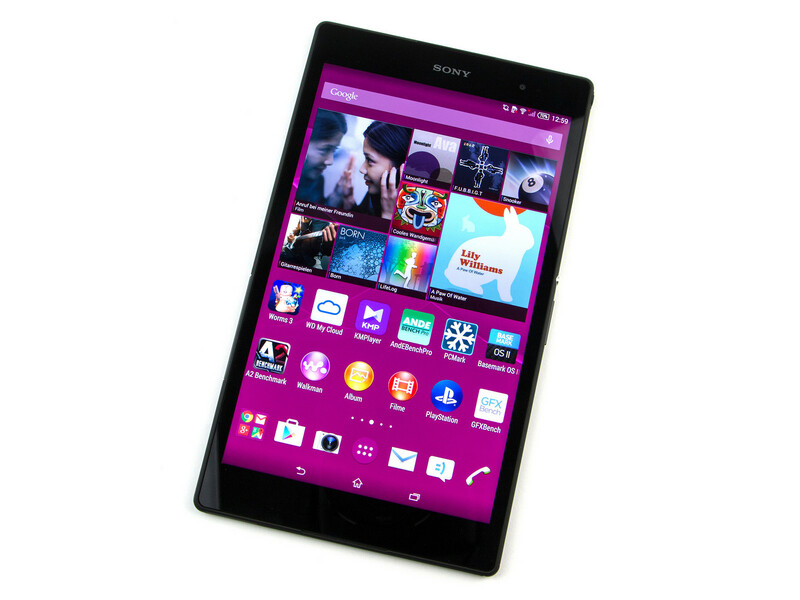 The Xperia Z3 Tablet Compact is definitely one of the best mini tablets available out there. High-end ARM SoC with 4 CPU cores up to 2.45 GHz and an Adreno 330 GPU up to 578 MHz. Based on Qualcomm's Krait 400 architecture and is manufactured in a 28nm HPM process. 86.59%: This is a good rating above average. Nevertheless you should not forget, that 10-15% of all notebook-models get a better rating.